2014 fleet predictions – HubNut – celebrating the average! On the face of it, the ClassicHub fleet has settled down quite nicely. The Sirion is a superb little car for most driving, the Disco is the heavy-hauler and off-road toy and I can’t cope without a 2CV on the fleet, so the 2CV fills that slot. All is not well though. Let’s start with the 2CV. She’s badly rotten and I’ve still no idea what I’m going to do about it. The bodyshell is in a right state, with some previous restoration and accident repair work hindering future restoration. It may be time to give up on this bodyshell. The running gear is still surprisingly good though. Some tricky decisions need to be made before the MOT runs out in April. Then there’s the Sirion. Good as it is, it sadly proves that modern cars still rot. It will take either a miracle or a good deal of welding to see it gain another MOT, which is a bit disappointing for a car with only 71,000 miles on the clock. It ticks more boxes than many cars I’ve owned though, demonstrating huge capability but also being very easy to drive, nice and small and wonderfully efficient. It’s a hard car to replace. I love 1990s vehicles, as they have enough cleverness to make them work very well, but not so much that you need a computer to work on them. Lastly, there’s the Discovery. This is the hardest vehicle to justify, which is why it might well find itself for sale in the New Year. As a vehicle, I like it very much, despite its many and obvious faults – the chief of which is a horrific inability to keep the weather out. Yes, it is useful for hauling stuff about, but my trailer is only rated at half a ton, which is within the capabilities of many smaller vehicles – if not quite as small as the other two on the fleet. Really, it’s just a big toy for playing about in. There are other downsides too. 4x4s seem to attract text talkers like no other vehicle. The Maverick was just as bad. I’m sorry, but I like my English as it should be written. I don’t always get it right, but I do my best to use all of the letters that should be used. I like to write how I speak. I rarely come across text talk amongst 2CVers, BXers or the Autoshite forum of which I’m a member – which celebrates the wonder of unloved cars. In fact, text talk is often rightly vilified amongst the members of the aforementioned enthusiasts. I’m not sure why this is, but I very much agree. The simple truth is that I don’t NEED a 4×4, and January is probably a good time to sell. It’ll be a sad sale, but it’s becoming a rather inevitable one. 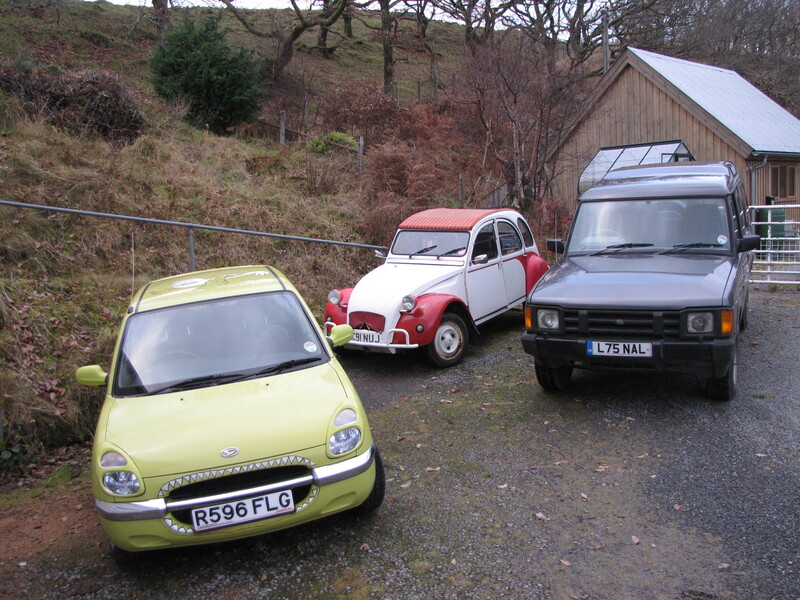 Before any of this though, there’s the small matter of taking the Sirion on a 1200-mile roadtrip to Scotland. Will I come back loving it more than ever or will it find itself joining the Disco in the classifieds?